After defining every Type that suits your experience, you need a way to measure the quality and quantity of the Desired Actions. This is when the Triggers come in. Triggers are specific features/actions that trigger the Achievement, and they need to be present in your system (physical or virtual) as Feedback Mechanics. Feedback Mechanics are cues (often visual, but can be audio or use other senses) that users have to keep track of their progress towards the Win-State. These usually come in the form of points, badges, levels, trophies, progress bars, and even avatars. In the end, Feedback Mechanics are meant to Trigger users to commit more Desired Actions. You should think of about 2–3 Triggers per type. 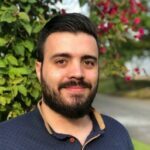 It is necessary to have at least one Trigger to be able to measure the user’s activity in the backend. At this point, you have got all the basics down. Now the time has come to act as a true Gamification Designer. The first step into mastery is owning the concept of Tiers. Tiers are a series of levels or elements in a system that is classified based on different variables, generally connected to a skill level. The most common Tier system seen in games, especially in eSports titles are Bronze, Silver, Gold, Platinum, and Diamond. These Tiers/ranks continue to be useful in most scenarios because their names refer to real-life elements that are easily classifiable in terms of value/rarity. Almost every person can tell which Tier gathers low, medium and high-level players, even if that person doesn’t even know the game. These Tier systems are based on complex algorithms to rate the skill level of each player (ELO system) and move him through the Tiers. In this case, our job is much more comfortable. We will need to come up with a Tier system to classify Achievements in terms of complexity, and not difficulty. We recommend three Tiers for brand new Achievements. Tier 1 Achievements are the ones that have only one Type and one Trigger as a requirement. Tier 2 are the ones with two different Types and one Trigger for each of those Types. Finally, Tier 3 Achievements are made with three Types and one or two Triggers per Type. DON’T WORRY! Here is how it looks like (we also cover some examples at the end). 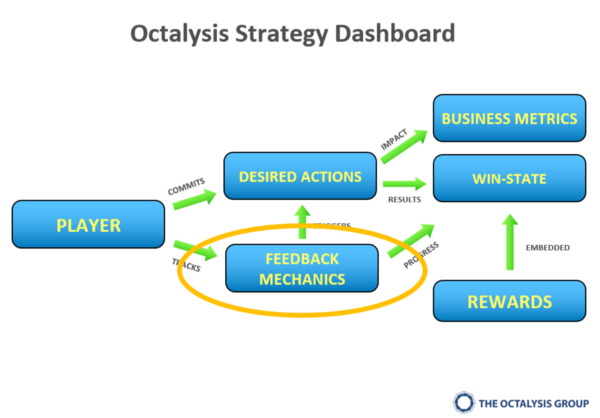 The last step requires you to go back to the Strategy Dashboard and look at the Rewards. 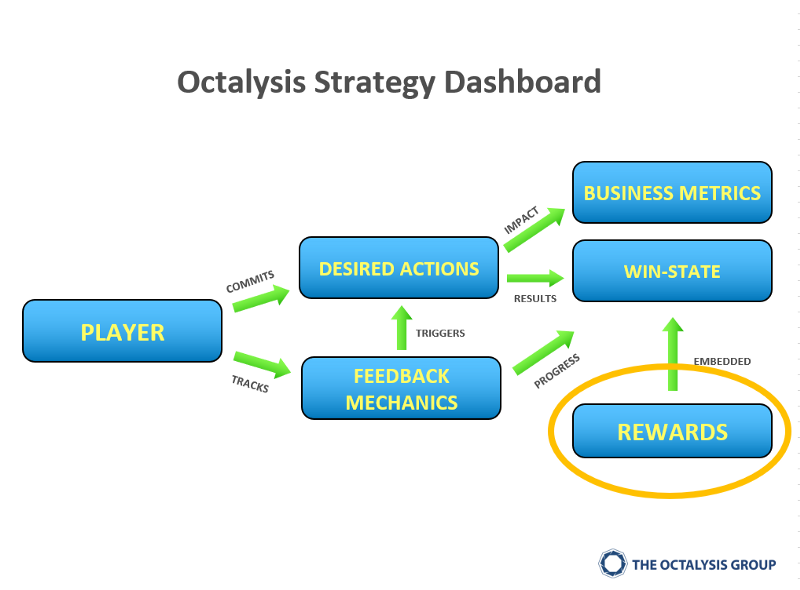 Rewards/Incentives are the fifth and final element to define in the Octalysis Strategy Dashboard. Incentives are basically what you can give users within your power that rewards their behavior and entices them to further action. This step allows you to add some extrinsic value to the Achievement economy, priming the user to engage with it. You made it to the end of the second part. You just learned all the tools to craft an achievement from scratch. Now you are ready to master them! “But … how will we measure the quality of the content?” you might be asking. Well, let’s imagine that Facebook already knows that the posts that include images or videos have a higher chance of getting viral. After defining our Trigger, we need a “Multiplier” that specifies how many times the user has to repeat the task. This sets the difficulty level of the Achievement. For now, we can leave it at 20 times. At this point, we can decide to leave this Achievement as a Tier 1, or try to increase its complexity by upgrading it to a Tier 2 or Tier 3 Achievement. 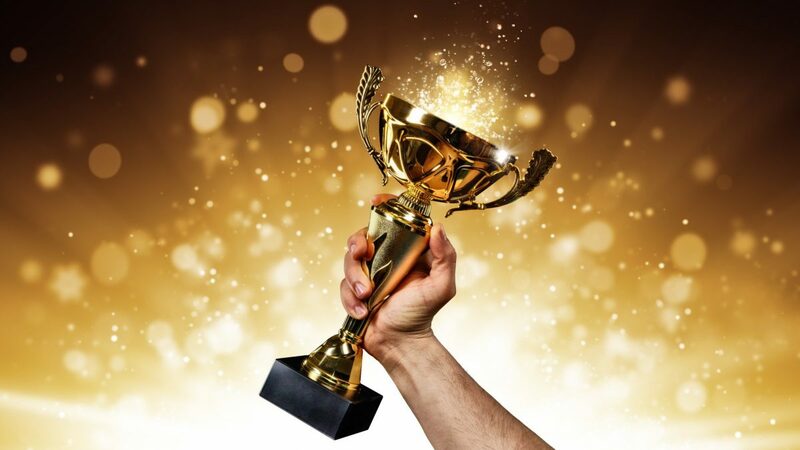 Typically, the users appreciate more the Achievements that took more effort to complete, either because the difficulty was too high, or because the complexity led them to strategize about the best way to get it. For the sake of this example, we will keep it as a Tier 2 Achievement, which should be the most common type of Achievement in most systems. Note: To make this one a Tier 2 Achievement, we need to have two Types and one Trigger for each of them. For this example, Facebook determines that “High quality” strongly relates to “Popularity”. The new type evokes CD5 and can be measured with the number of Likes (or reactions in general). Finally, we can decide how to reward our users. The Rewards vary a lot, from Badges to real money. We usually recommend implementing Boosters as a reward, since they empower the users with a CD3 punch, keeping them engaged in the short-term (a “Booster chain” could easily keep them engaged in the long-term as well). To make it a bit easier, let’s give our users an official, brand new Facebook Badge. Also, we want the users to know about this to incentivize them to post more high-quality content, so we are making this one a Fixed Action Reward. The end… or is it?? ?